To celebrate the 10th anniversary of its HyperX memory lineup, Kingston introduced the HyperX 10th Anniversary Edition memory lineup. These DDR3 modules are available with frequencies ranging from 1600MHz to 2400MHz, and voltages of 1.35V, 1.5V, and 1.65V. You can get them in capacities of 4GB, 8GB, 16GB, and 32GB in kits of 2 and 4. Kingston Technology Company Inc., the independent world leader in memory products, continues to celebrate its 10th HyperX anniversary with two announcements at 2013 International CES: the launch of the Kingston HyperX® 10th Anniversary Edition Memory and the finale of the HyperX 10th Anniversary StarCraft® II Tournament. With its elegant silver heatspreader, the new high performance Kingston HyperX 10th Anniversary Edition Memory complements the latest PC hardware and takes on serious workloads or the most intensive games. It is perfect for gamers, enthusiasts, overclockers and PC modders. With its low profile, HyperX 10th Anniversary Edition Memory fits under oversized CPU coolers and offers enhanced thermal dissipation for long-term reliability. The Intel XMP ready memory easily achieves best performance optimization by simply selecting a speed profile in BIOS ? with no need for manual adjustments. "Since 2002, our HyperX products have been the memory of choice for gamers, computer enthusiasts, overclockers and system builders," said Dara Mullarkey, HyperX business manager, Kingston. 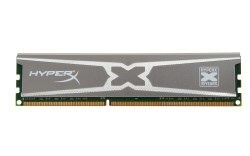 "The newly launched HyperX 10th Anniversary Edition Memory encompasses ultimate style and performance. As part of the Genesis family line, this stunning low-profile memory enhances the overall PC experience. In addition, hosting the StarCraft II tournament allows us to thank and give back to our customers and fans." Kingston is celebrating 25 years in the memory industry. The company was founded on October 17, 1987, and has grown to become the largest third-party memory manufacturer in the world. Watch the 25th anniversary video and see more information including a timeline of Kingston's history.